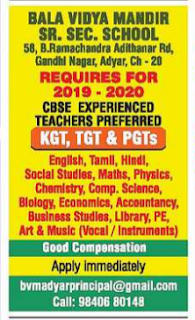 Adyar,Chennai has advertised for the recruitment of Teaching Faculty- PGT,TGT,KGT jobs vacancies. Interested and eligible job aspirants are requested to apply immediately.Check out further more details below. Name of the School: Bala Vidya Mandir Sr Secondary School,Adyar,Chennai. About School: Bala Vidya Mandir enjoys a justifiable reputation among schools in Chennai, for its balanced approach to education. In this school, Indian tradition and Western liberalism achieve a harmony. Students imbibe not only the knowledge reflected in their studies, but also a self confidence that stands them in good stead in the outside world. Qualified candidates and CBSE experience one can apply.